In this blog, we are going to break down what Tour Tempo achieves in terms of speed and increased distance. And how we do it. With speed we mean club head speed, and ball speed as a measure of a good swing with transfer of impact onto the ball. Now many golfer with decent handicaps posing the question, are in good shape, but would like to regain distance, and gain more consistency. The handicap result is due to their atheism, and level of competitiveness. Typically they display no proper body angles, no lag in the swing, flippy at impact, and incorrect tempo ratio like 4-to-1. The struggle with the over-the-top-move is another great loss of power, and source for the foremost distance killer; the slice. After getting ‘before’ videos and ‘before’ launch numbers as the first step, we can start the training. If you follow our blogs (courtesy John Novosel Jr.) at all, you know that the training does NOT involve hitting golf balls. That is a tired paradigm and not effective at changing motor skills, especially when you are working on speed. It is Y Drills, L drills, one arm swings and then tempo work with the SpeedBall. The thing to do THAT IS SPECIAL is that we do each drill exactly right. We do them slowly and feel what we are doing. Then we progress in speed while maintaining proper form. To think that we can just go play golf and/or change a (subconscious) motor skill while hitting balls on the range is not the case. Once we progress thru the speedball with Y- and L-drills, we then use 2 of our new training aids (not yet on the market): the LagMan® and the PowerAir®. When you combine these devices with the Power Whip and the SpeedBall training, there is a synergy that creates better mechanics, better feel and a ton of speed! You know where 3 of the most important keys to improving CHS (and thus distance) come from? The first one is improving mechanics with increased lag. The second one is using properly applied resistance to take advantage of the element of “SAID”. And yes… improving tempo. 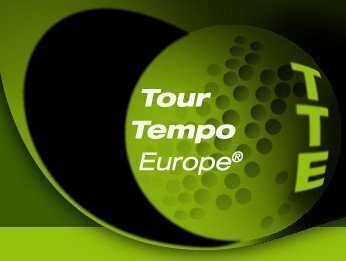 Combine these elements together, and you will get the results seen by Tour Tempo. So what specific training aids and protocols for these 3 important keys do we provide? The Lagman® and PowerAir® (with Power Whip) create a new paradigm. 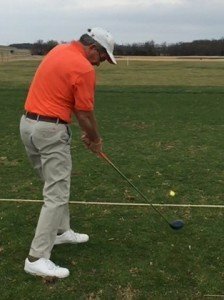 Namely how to feel creating the angle and maintaining the angle in the swing. First we learn it slowly, then we PROGRESS to more speed. When this is done even a few times, lag improves. Also, both of these training aids incorporate a SAID element, so the increased lag lights up new muscles and neurons in the brain, which truly make it deliberate practice. 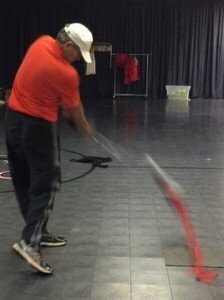 Once we’ve done this, we then progress to full speed swings with the SpeedBall with Power Module. The SpeedBall with Power Module gives the golfer perfectly applied resistance at impact. The brain gets told….. you have some serious resistance you need to overcome. The brain begins to recruit more speed & power knowing it has to swing THRU the hitting zone and get thru the Impact Target. With each swing you start to realise that you can swing faster and faster. But it does show what we are all capable of when we train with the correct tools and protocols. And it is efficient, if you think that it can be done in a matter of one (1) day. We then put it all together with Tour Tempo. The tones of Tour Tempo help the golfer to QUIT thinking and just be athletic and reflexive. It allows you to take your new swing and speed to the ball and to the course. Since the Tones never change (time-wise), you are able to create consistency. We highlight one case study. Here are two pictures with “before” and “after” position. The golfer is 65 years of age, has good athletic capabilities considering age, and has a clubheadspeed of up to 92 mph. He hits it with a weak slice. Now, look at the before and after picture. The difference is a much better body position and rotation in order to hit through the ball. His tempo went from a 26/11 before to 25/9 after. The speed went up to a 107 mph, so a 30 m distance gain with the driver. That was in less than a day working with our tools and protocols. More to come. Special thanks to Tour Tempo VIP-Level II teacher John Novosel Jr.